Chance to see the Clippers Vs Blazers 10/24 Contest! To Enter: Just follow @barrystickets on twitter and retweet the original tweet for this contest.Random drawing will be held on August 15th 2014. No Purchase Necessary. The Los Angeles Clippers announced their 2014 NBA preseason schedule which will include Oct 7th Vs Golden State Warriors at the Staples Center, Utah Jazz on Oct 17, Phoenix Suns Oct 22 and the Clippers Vs Blazers at the Staples Center on Oct 24th as their last preseason game at home. The Clip’s will hit the road for Oct 12th Vs Blazers at the Moda Center, Vs Jazz at the Energy Solutions Arena on Oct 13th, Vs Warriors at the Oracle Arena on Oct 21st and the Clippers Vs Nuggets at the Mandalay Bay Events Center on Oct 18th which is a great excuse to hit “Vegas Baby Vegas”! 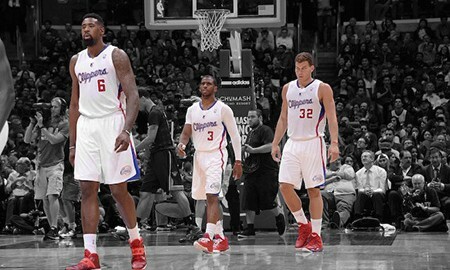 The Los Angeles Clippers will enter the 2014 – 2015 season as one of the top championship contenders. Their schedule for the upcoming season will include several difficult games. The Western Conference will be even stronger than last season. Amongst the toughest games of their schedule, the Clips will square off against the Oklahoma City Thunder, who eliminated Lob City in the Western Semis. The San Antonio Spurs will also be one of the most difficult opponents and teams like the Golden State Warriors and the Portland Trail Blazers will be very tough to beat, too. In the East, the Miami Heat and the Cleveland Cavaliers appear to be the two strongest opponents for Lob City, keeping in mind that the Indiana Pacers will be playing without Paul George. 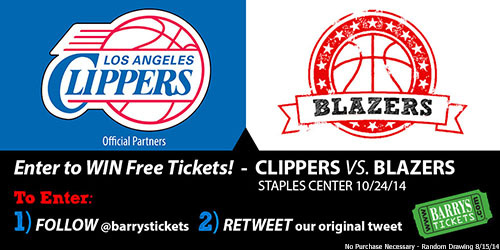 Barry’s Tickets is an Official Partner of the Los Angeles Clippers. For a complete list of Barry’s Tickets Contest Rules. Updated: See the Clippers Schedule for 2014-2015. NHL Playoff Fever is starting! Here is your chance to win LA Kings Gear, Barry’s Bucks and yes even a pair of Kings Tickets on us! If you follow us on Twitter, Instagram, Facebook or Google+ here is your chance to win! 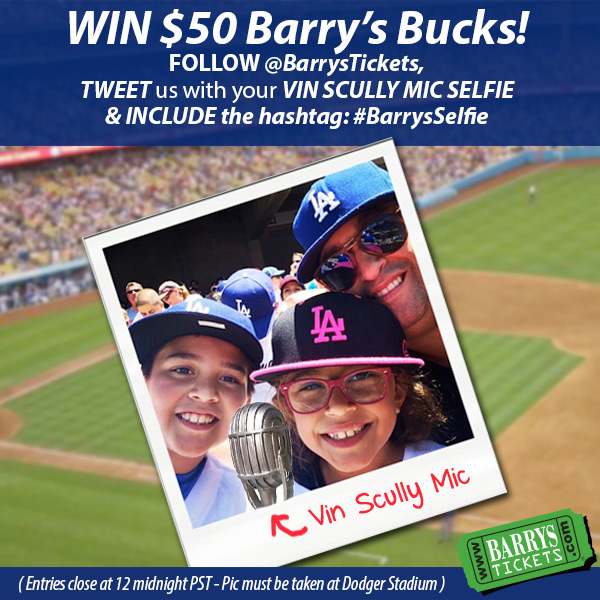 Scroll Down To See How To Enter this Barry’s Tickets Giveaway! Even with losses in four of their last five games the Los Angeles Kings held on and earned the 6th position in the NHL playoffs, finishing two points on top of the Minnesota Wild. The Kings 6th place finish has set up one of the most eagerly anticipated first round playoff matchups, a rematch of last year’s second round series between the Kings and the San Jose Sharks. Last season the Kings defeated the Sharks in seven spirited games, a series were the home team won each matchup. By virtue of an outstanding regular season the Sharks will have home ice advantage. Season Series: The Kings held the advantage in the season series between the two teams, three games to two. The Kings won one of the three games played in San Jose, a 1-0 shutout by Jonathan Quick on January 27th. The Sharks won the last game between the two teams, a 2-1 win on April 3. Other than a 4-1 Kings victory on December 19th all of the games were decided by a goal, indicative of just how closely matched the two teams are. The tight games in the season series mirror last year’s playoff matchup in which all seven games of the series were decided by just a lone goal. San Jose Sharks- who to watch: The Sharks feature a deep roster of veterans that has been together through several playoff appearances. The aging combination of Joe Thornton and Patrick Marleau are still strong performers along with young stars such as Joe Pavelski, Logan Couture and Brent Burns. Pavelski led the Sharks in scoring this season with 41 goals, while Marleau contributed 33. Right Wing Brent Burns, a former defenseman, and Couture give the Sharks tremendous size and speed up front with both scoring over 20 goals this season. Why the Kings will win: The Sharks had a better regular season, but the NHL playoffs are a whole new season and the Los Angeles Kings are built for the playoffs. Stanley Cups are won with good goaltending and the Kings have an advantage in net with Jonathan Quick. Quick has proven time and time again that he performs best in pressure situations and should have the advantage over Antii Niemi. Niemi had a strong overall regular season but has struggled in the month of April. The Sharks will need their veteran goaltender to be in strong form. Offensively the Kings have benefited from the acquisition of Marian Gaborik, a trade deadline pickup from the Columbus Blue Jackets. Garborik has scored 15 points in 18 games as a member of the Kings, giving their offense an additional component. The key for Los Angeles is earning a victory in San Jose to wrest home ice advantage away from the Sharks. More Information On This Barry’s Tickets Giveaway! Just Mention @Barrystickets and use hashtag #BTSKINGS for your chance to win LA Kings Gear, Barry’s Bucks and yes even LA Kings Vs Sharks Tickets! You can enter once daily per social media account (Twitter and Google+ Only). This Barry’s Ticket Contest is continuous and will be running throughout the LA Kings Vs Shark’s first round playoff games along with other contests. Winners of tickets must pick them up on the day of the game and cannot be exchanged for another game. Most important you must be following us to win! Facebook: Just Comment on our post! Barry’s Tickets is located just caddy-corner from the Staples Center. Barry’s Tickets is open past the drop of the puck perfect for Los Angeles traffic and picking up your tickets late or purchasing Kings Tickets on the night of the game. For a complete list of contest rules click here. Barry’s Ticket Service is not affiliated with the NHL or the Los Angeles Kings. BARRY’S TICKET SERVICE reserves the right to change or cancel this promotion at anytime.